The big news in the e-reader device world this year is the introduction of the Kindle Fire, a 7″ touchscreen LCD tablet that goes head-to-head with the new Nook Tablet, and undercuts the larger, more expensive Apple iPad 2. There is also a new generation of e-Ink-based e-reader devices, mostly focusing on adding touchscreens to the reading experience. And prices have come down fairly dramatically from last year, with sub-$100 e-readers fairly common. Click on the device names in the bullet point lists for my more detailed posts about each model. 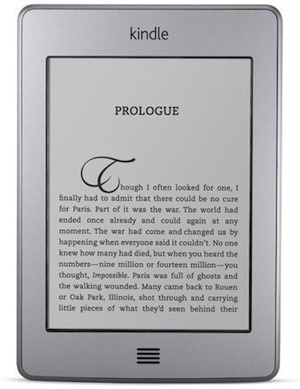 On the e-reader side, Amazon, B&N, Kobo, and Sony all have new e-Ink based offerings, each offering touchscreen models. Prices have come down to about $100. Amazon has an array of new 4th-generation Kindles this holiday season, starting at just $79 for the simply-named “Kindle,” which is their basic e-reader, lacking a touchscreen and keyboard (the 3rd-generation models are now called “Kindle Keyboards”). They make up for lacking these features with a small size, low weight, and very low price, starting at just $79 ($109 without “special offers“). Amazon also offers the Kindle Touch, which adds a touchscreen and starts at $99 ($139 without offers). Both models come with Wi-Fi connectivity. If you want to add 3G, the Kindle Touch 3G is $149 ($189 without offers). Find the Kindle Keyboard 3G (normally $139) for just $89 at Best Buy. Target is offering it for $85 in-store on Black Friday. Staples offers the $79 Kindle (with offers) with a free $15 gift card. Radio Shack does the same with a $10 gift card. Of course, $79 for the basic Kindle is hard to beat — and you can order from Amazon or buy it anywhere without waiting in Black Friday lines. UPDATE: The 9.7″ Kindle DX is $120 off, just $259 from Amazon until Monday. Barnes & Noble’s Nook Simple Touch has the same 6″ e-Ink Pearl screen as the Kindles, and (as the name implies) comes with a touchscreen. It is 7.5 ounces, has Wi-Fi, and adds an SD memory card reader. It retails for $139. The Nook Simple Touch is just $79 for Black Friday, matching Amazon’s non-touchscreen Kindle, even without “special offers.” Alternately, Target offers a $30 gift card with the purchase of the Simple Touch for $99. 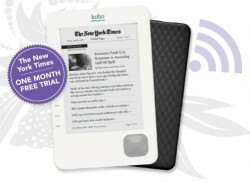 Kobo offers its $99 Kobo Wireless and $139 Kobo Touch, both of which have the same 6″ e-Ink screen as the B&N and Amazon models. Both models offer Wi-Fi connectivity, and the more expensive Touch (as the name implies) adds a touchscreen. They have only 1 GB of storage, but do include an expandable SD card slot, and come pre-loaded with 100 free public domain books. 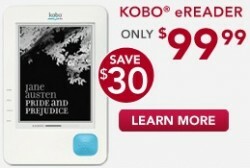 Kobo is offering its Touch e-reader with “offers” for just $99. The latest Sony e-reader, the PRS-T1 (also called the “Reader Wi-Fi”), continues Sony’s touchscreen tradition (while the Kindle, Nook, and Kobo are recent touchscreen converts, Sony e-readers have had touchscreens for years). Like the other 3 above, this model also comes with the 6″ e-Ink Pearl screen and Wi-Fi connectivity. 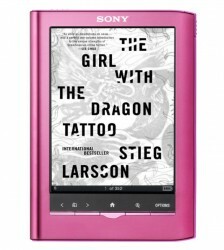 The Sony touts itself as the lightest 6″ touchscreen e-reader (just 5.9 oz) and, like B&N, takes aim at Amazon’s ad-supported “special offers” models by calling itself “Awesomely Ad Free.” Sadly, at nearly double the cost of Amazon’s entry-level model, Sony maintains its tradition of overpricing. I haven’t seen any yet, but I’ll keep my eyes peeled and update this post if I find any. Amazon and B&N’s new 7-inch offerings highlight the new tablet/e-reader hybrids, and Apple’s iPad 2 continues to be the top-selling tablet by a wide margin. 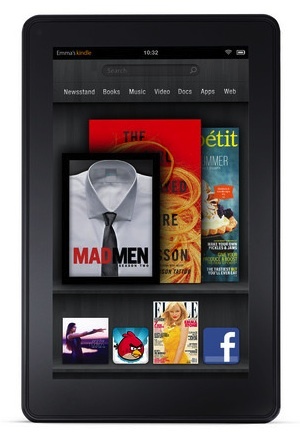 Amazon’s Kindle Fire boasts a 7″ LCD touchscreen, a dual-core 1 GHz processor, and 8 GB of storage for movies and other content. More impressive than the hardware is Amazon’s custom software (including its cloud-computing-accelerated Silk Browser and unlimited cloud storage for Amazon content) and content ecosystem, which includes Amazon Video on Demand, the Amazon MP3 store, the Amazon Android App Store, and of course the Amazon Kindle Store with over 1 million e-book titles. Probably the most impressive thing about the new Kindle Fire, however, is the price: at just $199, it undercuts B&N’s tablet substantially and is well under half the cost of the least expensive iPad 2. B&N’s Nook Tablet is an update of last year’s Nook Color, and is of similar size to the Kindle Fire, with the same 7″ LCD touchscreen (although B&N boasts a laminated & bonded “VividView” display that is said to reduce glare and improve readability). Its hardware specs are a little better than the Kindle Fire, with double the RAM and internal storage, although B&N only allows users to access a paltry 1 GB of that storage for their own stuff — the rest of the space is kept free to buy stuff from B&N. B&N lacks the large content ecosystem that Amazon has created, although it does have a healthy e-book store, interactive children’s books, magazines, and a small but growing app store. If you’re OK with last year’s tablet model (the Nook Color), you can get it plus a $30 Target gift card for $199 at Target stores. Apple’s iPad 2 is still the 900-pound gorilla of the tablet world (no, that’s not a crack about its weight), outselling all other tablets by a considerable margin. 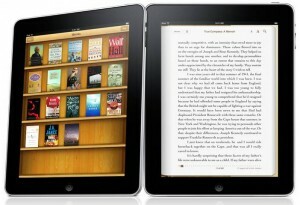 The smaller, lighter, cheaper Kindle Fire and Nook Tablet might be its first serious competition. However, the iPad counters their low prices with a larger 9.7″ LCD touchscreen, an external video camera, GPS, Bluetooth connectivity, available 3G connectivity, and a much more robust App Store. On the down side, the iPad 2’s price ranges from $499 for the 16 GB Wi-Fi model, all the way up to $829 (plus data fees) for the 64 GB Wi-Fi + 3G model. 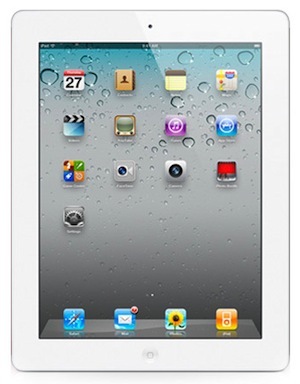 Apple will be knocking $41 to $61 off the price of the iPad 2, so the 16 GB Wi-Fi model will sell for $458. If you’re not sure which tablet you want, check out my Kindle Fire vs. Nook Tablet comparison post here. Whatever you decide, good luck with your holiday shopping, and please be sure to come back and comment if you find a better deal, or to let us know how you like your new e-reader or tablet! 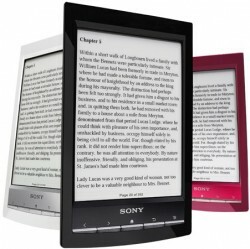 Sony announced today that it is dropping the price of its new touch-based PRS-T1 e-reader by $20, from $149 to just $129. This new Sony e-reader, which boasts wi-fi connectivity in addition to the touchscreen, weighs in at just 5.93 ounces. While still above the Kindle 4’s starting price of just $79, the price drop brings the Sony reader down into the right price range. Sony had a history of badly overpricing its e-readers, which prevented it from gaining much market share, at least in the U.S. This holiday season is certainly shaping up to be the year of the sub-$100 e-reader, with Kindles, Nooks, and now Sonys all slashing prices in recent weeks. For more info on the PRS-T1, please see my previous post here. Sony recently announced a new e-reader with both a touchscreen and Wi-Fi connectivity. At just 5.93 ounces, Sony is touting it as the world’s lightest touchscreen e-reader. Compared to the Kindle’s 8.5 ounces (which I find to be pleasantly light), under 6 ounces qualifies as featherlight — easily lighter than most printed books. It is also just 8.9 mm in thickness. The PRS-T1 should be available in October for $149. Finally, Sony realizes that it can’t charge double what Amazon and B&N charge for the Kindle and Nook! Even better, they finally added Wi-Fi to an e-reader at a reasonable price. The touchscreen on the PRS-T1 is the infrared-based touchscreen system introduced by Sony that eschews the older touchscreen layer that inhibited readability. The screen is the standard 6″ diagonal, 600 x 800 pixel, 16-level greyscale e-Ink Pearl display that should offer great contrast and readability. It runs on a heavily modified version of the Android operating system. It comes with 2 GB of space (1.3 GB usable), and also includes a MicroSD card slot for memory expansion up to 32 GB. 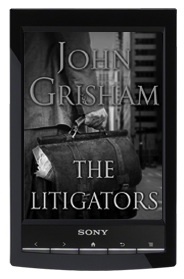 As with earlier Sony e-readers, it reads e-books in the ePub format. If you’re a fan of Sony products, and like the idea of a featherlight e-reader, it sounds like the new Sony is worth a look. The Sony Pocket is an especially good deal, since it’s also $50 off. And, considering that you can select from a number of cases, including cases with built-in lights that retail for $50, a lighted case and Sony PRS-350 for $129 is a pretty good deal — $100 off the combination. I’ve previously discussed the strengths and weaknesses of the various Sony E-Readers and B&N Nooks. A couple of interesting e-reader deals I stumbled across today: the latest-generation Sony Pocket E-Reader (model PRS-350) is on sale at Wal-Mart for $128, with free shipping. The Sony PRS-350, which I cover in more detail here and here, comes with a 5″ e-Ink Pearl touchscreen, and weighs only 5.64 ounces. If you’re looking for something very small and light, and that is also compatible with Overdrive library e-books, the Sony at this price is a compelling choice (I’ve said before that the Sonys’ major problem is their high prices). On the down side, this model does not have wireless connectivity (so you have to download e-books to your computer and put them on the device with a USB cable). While I mainly discuss the major e-reader brands (Kindle, Nook, Sony, Kobo, and iPad), just for a little variety I’ll throw in a mention of a sub-$100 e-reader deal. 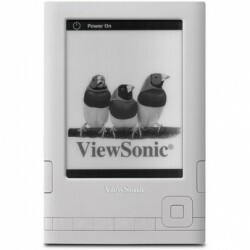 Those of you looking for a budget e-reader may want to consider the ViewSonic VEB620, on sale at B&H for $99.95. The ViewSonic does come with a 6″ e-Ink screen, reads ePub e-books and PDFs, and has a respectable 2GB of internal memory plus an SD memory card slot. It also plays MP3 music files, has an accelerometer (so you can turn the device to switch from portrait to landscape mode, and also “shake” it to turn pages), and weighs only 7.8 ounces. On the down side, the display does not appear to be the newer, much better e-Ink Pearl display that I find so compelling in the Kindle 3 (or new Sonys), it doesn’t have wireless connectivity, and doesn’t appear to have basic functions like a built-in dictionary or folders, let alone text-to-speech or Internet access. It also doesn’t appear to be linked up with an e-book store, making it more difficult to find content to read on it. Finally, it has poor reviews on Amazon and elsewhere, with reviewers complaining that it’s very slow to open e-books. Overall, I wouldn’t recommend the ViewSonic (I think an extra $28 or $39 for the Sony above or the $139 Kindle 3 Wi-Fi will be well worth the extra cost), but I thought I would present it for your consideration. 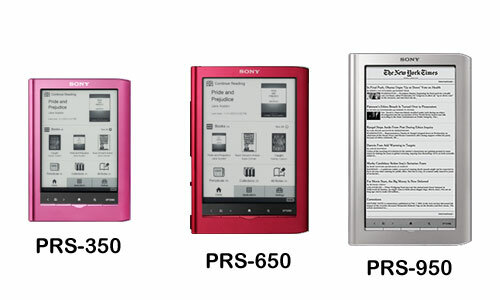 The new Sony E-Reader lineup: the Pocket, Touch, and Daily. I got a chance to try out the new Sony E-Readers at a local Best Buy recently. Sony’s new lineup, discussed here, includes the 5″ PRS-350 Pocket Edition ($179, currently on sale for $149), the 6″ PRS-650 Touch Edition ($229), and the 7″ PRS-950 Daily Edition ($299). Each has the new e-Ink Pearl screen, for excellent contrast and readability. 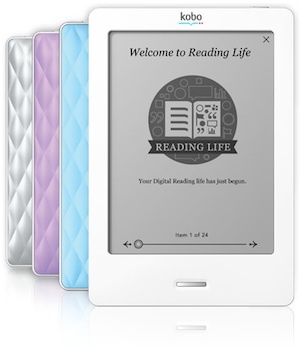 Each is made with an aluminum frame (most e-readers have a plastic frame), and are available in multiple colors (whereas most e-readers are white or gray). And each has a new touchscreen technology: a grid of infrared lasers is embedded around the edges of the screen to sense your touch — which is a great improvement over Sony’s old touchscreen method, which required an extra layer of plastic over the screen that muddied the display. Sony’s e-readers have been described in many reviews as good hardware that is somewhat overpriced and lacking an easy-to-use, robust e-book ecosystem. It’s almost like Sony wants to make great, pretty, expensive products, and leave it to the user to figure out how to actually get e-books on the device and use it. For example, only the most expensive version (at a whopping $299, or more than double the cost of the $139 Kindle 3 Wi-Fi or $149 Nook Wi-Fi) comes with any form of wireless connectivity; the cheaper two versions require downloading books to your computer and sideloading them to the device through a USB cable. Also, Sony’s e-book store is harder to navigate, has a smaller selection, and the e-books are often more expensive than the Amazon or B&N stores. On the plus side, Sony’s e-readers do read the ePub format and can access Overdrive library e-books. As for the hardware itself, I have to say I wasn’t as impressed with them as I thought based on reading their descriptions. For some reason, I didn’t prefer the aluminum frames to plastic. And I’m not a fan of the controls: the main culprit is the page turn buttons, which are located on the left side of the row of 5 metal buttons below the bottom of the screen, and are therefore not in a comfortable position for one-handed reading (even if holding it with your left hand, you’d have to hold the device by the very bottom corner). I far prefer the page turn buttons on either side of the screen, like on the Kindle or Nook. And I was disappointed with the touchscreen, which is hyped as the defining feature of the new Sonys (it’s the only major e-reader with a touch-enabled e-Ink screen). The description of the new touchscreen system, which doesn’t affect readability, sounds impressive. But I found that it didn’t register my touch several times, with a little minus-sign-in-a-circle symbol showing up in the bottom right corner of the screen. Probably a bad sign that the touchscreen is so finicky, there’s programming for a symbol to show up when it doesn’t work right. Further, I’m not jumping on the touch bandwagon: I think it’s overrated for most uses, even on something like the iPad, and I find myself wishing for a “low-tech” mouse. Sure, touchscreens are helpful for some things, but as often as not they’re horribly imprecise (and I click the wrong link on a web page or miss a tiny button), your fingers obscure some important screen element, or I miss the tactile feedback of a good old-fashioned control pad on games. For e-readers specifically, I don’t see much benefit in being able to touch the screen, and one clear drawback is getting finger oils on your screen. All in all, I was mildly disappointed by the Sonys, and I didn’t find them compelling. Since I’m not a fan of their defining feature (touchscreens), I find their controls inconvenient, their e-book store is lacking, and I consider them pretty badly overpriced (their normal prices are excessive; when on sale they’re merely on the high end), I don’t really recommend them. On the other hand, they are small and light, and they come in a variety of screen sizes (5″ and 7″, in addition to the normal 6″ screen you’ll also find on most other e-readers). And they are one of the few e-readers (along with the Kindle 3, but not the Kindle 2 or Nook) to come with the new e-Ink Pearl screen, which I consider a must-have e-reader feature. UPDATE: For the 2011 version of this post, please CLICK HERE. In anticipation of Black Friday and the upcoming holiday gift-giving season, I thought I’d put together a post for anyone thinking of picking up an e-book reader for themselves or as a gift this holiday season. I’ll discuss the different e-readers out there, give my experiences and recommendations, and tell you the best places to pick up a copy of each (in-store and online) — making sure to cover special Black Friday deals, which mostly consist of older models on sale for under $100. If you’re not yet sure if an e-reader is the right gift, you may want to take a moment to consider my “Do I Need An E-Book Reader?” post, which details the types of people who would enjoy and get the most use out of e-readers. I anticipate that e-readers will be a very popular holiday gift this year, as prices have come down and the technology has improved pretty dramatically from even a year or two ago. There are now more choices than ever, from black & white e-Ink-based devices specialized for reading, along with color LCD multi-purpose tablet computers that can read books along with checking email, going online, and watching videos. Amazon’s Kindle 3 is the most popular e-reader, and for good reason. It comes in two versions: the $189 Kindle 3 Wi-Fi + 3G, and the $139 Kindle 3 Wi-Fi. The $189 version comes in two colors: white and graphite, and the $139 version is graphite only. Each model has a 6″ e-Ink screen, a full keyboard, and a battery that lasts for a month. The difference between the two models is that the $189 Wi-Fi + 3G version can connect wirelessly through AT&T’s cellphone network (with no monthly fee, as lifetime 3G access is included) and where you have access to a Wi-Fi hotspot (like at your house or office or coffee shop), while the $139 Wi-Fi only model can only connect at a hotspot. I own a Kindle 2, and I strongly recommend the new Kindle 3 to anyone who enjoys reading fiction books: it is the most full-featured e-reader, with a built-in dictionary, adjustable font sizes, text-to-speech, notes & highlights, limited Internet browsing, some apps and games, and more. It also comes at a very reasonable price, has the newest and best e-Ink Pearl screen with increased contrast, is very small and light (only 8.5 ounces), the battery lasts for a month, and Amazon has the world’s largest e-book store, with over 750,000 titles. My recommendation: avoid sales tax and buy it from Amazon.com (with free shipping), their customer service and generous return policy is legendary. Almost a separate animal, Amazon also offers the large-screen $379 Kindle DX 2, which offers a huge 9.7″ e-Ink Pearl screen. It’s great for reading PDFs, and much better at browsing websites than its smaller sibling. Of course, it’s far heavier (18.9 oz), less portable, and more expensive — I personally don’t think it’s worth double the price of the K3. Black Friday Special: So far, there aren’t any Black Friday deals on the K3 and I don’t think we’ll see any, since the K3 only came out in August and has been selling very well; in fact, there are signs it may sell out before Christmas. But the Kindle 2 will be on sale for just $89 from Amazon.com on Black Friday, which is a great deal on what is still an excellent e-reader (one I use every day), and the best of the Black Friday e-reader deals, in my opinion. It goes on sale here, starting at 9 AM Pacific on Nov 26, and I’d expect it to sell out quickly. 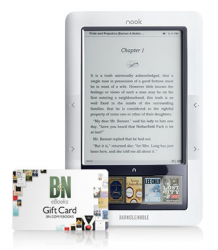 Barnes & Noble’s Nook and Nook Color is the second-most-popular e-reader brand, behind the Kindle. The Nook has recently split into two product lines: the new $249 Nook Color, an Android-based tablet computer with a 7″ color LCD screen that B&N is marketing as a tablet “focused on reading,” and the original $199 Nook 3G + Wi-Fi and $149 Nook Wi-Fi, which each have a 6″ e-Ink screen along with a small LCD touchscreen below it. The Nook Color is marketed as being a device focused on reading, and able to read color magazines and interactive children’s books, browse the Internet, and run certain (but not all) Android apps and games. However, I find that its LCD screen means it suffers from a number of drawbacks, including that it’s heavy (15.8 oz), expensive ($110 more than the K3), has a short battery life (8 hours), and lacks 3G connectivity. However, when considered as a tablet that can also read, it is half the price of an iPad. 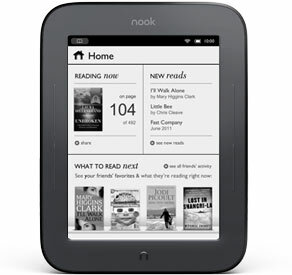 For pure reading, I’d definitely recommend one of the original Nooks (and their e-Ink screens) instead. 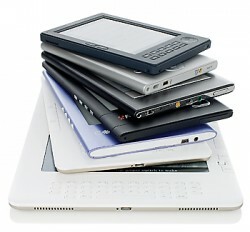 They share many of the same features as the Kindle 3, although they add an LCD touchscreen, a memory card slot, and the ability to read free library e-books; however, they are heavier, slower, have shorter battery life, and lack the new e-Ink Pearl screen. 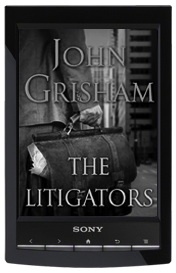 As the Nook “Classic” line is now a generation behind the Kindles yet they cost slightly more, I can’t recommend them any more, unless library books are a must-have feature for you. Black Friday Special: Best Buy will have the $149 Nook Wi-Fi model on sale for just $99 on Black Friday, which is a great deal if you are a Nook fan. The Sony E-Reader Line includes the $149 PRS-350 Pocket Edition with a 5″ e-Ink touchscreen, the $199 PRS-650 Touch Edition with a 6″ e-Ink touchscreen, and the $249 PRS-950 Daily Edition with a 7″ e-Ink touchscreen. Each uses the new e-Ink Pearl screens, with a touchscreen technology using infrared beams instead of an extra screen layer that would make the screen less crisp. The Sonys have the advantage of reading library e-books and some people may prefer the touchscreen, but their prices are a little high compared to the Kindles. Unfortunately, only the expensive Daily Edition comes with wireless (Wi-Fi + 3G) connectivity; the other two models have none, and need to use a memory card or be hooked up to a computer with a USB cable to transfer books. One good thing about the Sonys is that you get to choose the size of your screen: you can pick the 5″ screen of the Pocket Edition, which gives you ultra portability and light weight at only 5.64 ounces; you can stick with the “standard” 6″ screen size of the Touch Edition, which is still only 7.93 oz; or you can opt for the nice 7″ screen of the Daily Edition, which is only a tad heavier than the Kindle at 9 ounces. As I said, the downside is price, although Sony just reduced prices and made their lineup much more competitive. For $249, the Daily Edition is $60 more than the K3, which may be worth it for a larger screen. If you like library books and the touchscreen, or want a slightly larger or smaller screen, the Sonys are your best choice. Black Friday Special: Dell offers the 5″ PRS-350 for $119, or if you’re OK with last year’s model, the 5″ PRS-300 Pocket Edition (no touchscreen) will be on sale for $99 at Wal-Mart on Black Friday. The Kobo Wireless E-Reader is a simple, no-frills e-reader that lacks some of the extra features of the Kindle (no keyboard, Internet access, notes, text-to-speech, etc.) or Nook (no LCD touchscreen or e-book lending feature). While the $139 Kobo Wireless (their second-generation e-reader) added Wi-Fi connectivity and a built-in dictionary to match the Kindle and Nook, and does read library e-books, it still falls short in the feature department, considering that it is roughly the same price. On the plus side, the Kobo is simple to use and focused on reading, with fewer distractions (some people might consider the lack of games or Internet access a good thing — parents, for example). But the bottom line is, unless you’re a die-hard Borders fan (the Kobo interfaces with both the Kobo and Borders e-book stores), I think the Kobo falls behind the competition. Black Friday Special: Wal-Mart lists the Kobo Wireless for $129, and the previous-generation Kobo E-Reader (without wireless or a built-in dictionary) is still $99 from Borders.com. Apple’s iPad is an interesting device: far more than an e-reader, some love its ability to do many other things (run apps and games, surf the Internet, play movies, etc. ), while some don’t consider it an e-reader at all, since its 9.7″ LCD screen makes it much harder on the eyes, heavier, more expensive, and it has much shorter battery life than the e-readers listed above. Starting at $499 for the 16GB Wi-Fi model, and ranging up to $829 for the 64GB Wi-Fi + 3G model (which also carries a $30 per month fee for 3G wireless access — so a whopping $1,549 for a 3G iPad with 2 years of service), it is in a completely different price range than the other e-readers described here. The iPad is really a tablet computer that can surf the Internet, play all the cool apps and games on Apple’s App Store, watch videos, perform light computing work, and — oh yeah — read e-books. Personally, I never read on my wife’s iPad — I far prefer the e-Ink screen (much easier on my eyes), light weight (much easier to hold with one hand), and superior battery life (measured in weeks instead of hours) of my K2 for reading. However, the iPad’s full-color LCD screen lets it do things the Kindle either does poorly or can’t do at all, and I find myself using the iPad for playing games, using apps, surfing the Internet, checking email, and watching movies. To me, the question becomes: are you (or the person you’re buying a gift for) an avid reader, or not? For someone who reads more than a book a month or so, I’d recommend a dedicated e-reader over the jack-of-all-trades iPad. For someone more interested in all that other stuff — and who might like to check out a few books a year, or maybe read some magazines — I’d recommend the iPad, or possibly the less expensive Nook Color, described above. Black Friday Special: Apple’s Black Friday sale (online or at your local Apple store) knocks $41 off the iPad and $21 off the iPod Touch line. Of note, some T.J. Maxx and Marshalls stores have the 16GB Wi-Fi iPad for just $399 — but stock appears to be limited, and quite random. Final Thoughts: In addition to the e-readers detailed above, there are several other brands of e-readers out there, although I don’t recommend any of them for several reasons. The Kindle, Nook, Sony, and Kobo e-readers are the 4 most popular brands, and for good reason: they have e-Ink screens, the best prices, and the best e-book stores. There are a bunch of other e-readers out there (including the Aluratek Libre, Velocity Cruz, Augen Book, Pandigital Novel, Cybook Opus, Ectaco JetBook, Sharper Image Literati, and a bunch of Android-based tablet computers), but each suffers from serious problems: many use LCD screens that are harder on the eyes, yet don’t even have the redeeming features of the iPad or Nook Color; several are overpriced; most of them lack features; and many don’t interface easily with a decent e-book store. In summary, my recommendation depends on two things: your budget, and whether the person you’re buying an e-reader for is an avid fiction reader or not. For those who read a book a month or more, I recommend the $189 Kindle 3 Wi-Fi + 3G, as I think it’s the best e-reader out there and a great value for the money (the $139 Kindle Wi-Fi is an excellent choice as well if you can live without the 3G). For those on a budget, I recommend Amazon’s Black Friday special, the $89 Kindle 2. And, for those who aren’t all that interested in reading and really want a mini-computer that does lots of different things (and can read e-books in a pinch), the iPad is the way to go. Through October 31, Borders is aggressively discounting the e-book readers it sells, offering $30 off, 5 free e-books, discounts on accessories, and other perks. 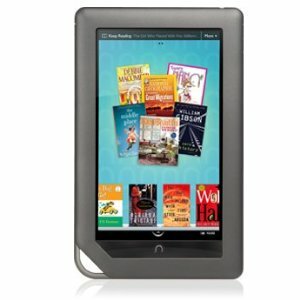 Of note, the Kobo E-Reader is $30 off, and now costs only $99.99 from Borders.com. That’s quite a deal for an e-Ink based e-book reader. Of note, it’s the older model of Kobo E-Reader, not the new Kobo Wireless E-Reader, which adds Wi-Fi connectivity (the new model is “coming soon” and still $139.99). A total value of $75, the free eBooks include “Slow Death by Rubber Duck” by Bruce Lourie and Rick Smith; “Soccernomics” by Stefan Szymanski; “Phantom of Pemberley” by Regina Jeffers; “Eye of the Raven: A Mystery of Colonial America” by Eliot Pattison; and “Wingnuts: How the Lunatic Fringe is Hijacking America” by John Avlon. Borders also offers a free cover with built-in light with the purchase of the Sony Touch or Sony Pocket e-readers. They’re also offering 20% off all e-reader accessories (including cases and covers) with the purchase of any device. Today, Sony refreshed its line of e-readers, bringing the new e-Ink Pearl screen (used in the Kindle 3) to the Sony line. One could argue that Sony started the modern e-reader revolution (as its first model came out before the Kindle), but it wasn’t until Amazon’s Kindle 2 came out in 2009 that e-reader sales really took off. Since then, Sony has been the forgotten one of the “Big 3” (Amazon, B&N, Sony) — and has even taken a back seat to Apple (which doesn’t even make e-readers) in the eyes of many. Like with much of their other technology, the Sony hardware is impressive, but somewhat quirky, expensive, and lacking in ease of use. First, the good news: the new Sony e-readers have the higher-contrast e-Ink Pearl screen we’ve discussed when covering the Kindle 3. They are also very small and light — even smaller and lighter than the K3. They all sport new touchscreens that use infrared sensors built in to the edges of the screen, so it doesn’t impede reading (the old touchscreen layers made the screen harder to read and thus kinda sucked). And they support DRMed ePub files, so you can read library books on them (although it’s a bit of a hassle). On the down side, they’re considerably more expensive than the Kindles, their entry-level version only has a 5″ e-Ink screen (compared to the 6″ one found on Kindles and Nooks), and only their most expensive model (not yet available) has wireless connectivity — the 2 models available now don’t even have Wi-Fi, let alone 3G. That means you have to use your computer to purchase, download, and transfer books to your device. There are three models: the 5″ Sony PRS-350 (“Pocket Edition”) for $179, the 6″ PRS-650 (“Touch Edition”) for $229, and the 7″ PRS-950 (“Daily Edition”), due out before the holidays for $299. All 3 models use the new e-Ink Pearl displays and improved touchscreens. The Touch Edition adds the larger (standard-size) screen and memory slots. The Daily edition adds an even larger screen and Wi-Fi + 3G wireless connectivity. The 5″ PRS-350 Pocket Edition has 2GB of built-in storage (no memory card slots), weighs only 5.64 oz (the Kindle 3 Wi-Fi weighs 8.5), measures just 5.71 x 4.11 x 0.33 inches, and costs $179. Compared to the Kindle 3 Wi-Fi, you pay $40 more to get a touchscreen, ePub support, and smaller size, but you lose out with a smaller screen, no wireless connection, no Internet, no text-to-speech, worse battery life, less storage, and you don’t get to use Amazon’s Kindle e-book store: Sony’s E-Reader Store is far inferior. For just $10 more, you could even splurge for the Kindle 3 Wi-Fi + 3G, and get unlimited 3G connectivity for life. The 6″ PRS-650 Touch Edition (does that name make sense when they all have touchscreens now?) costs $229, and brings you the larger screen and expandable memory in a slightly larger but still light (at 7.93 oz) package. For $90 more than the K3, you get the same size (and type) screen, so it’s more of an apples-to-apples comparison. Unfortunately, the library book support (an important feature), touchscreen (which I don’t think adds much to the reading experience), and slightly lighter weight don’t outweigh the $90 cost savings and other advantages of the Kindle. The 7″ PRS-950 Daily Edition adds wireless (Wi-Fi and 3G) connectivity, along with a larger 7″ screen. At 8.99 ounces, it’s fractionally heavier than the K3, but still light enough for easy one-handed reading; that’s probably a good trade-off to get a larger screen (which means more words per page and fewer page turns when reading, especially if you like to read at larger font sizes). The problem is the $299 price tag, which pushes it almost into the 9.7″ Kindle DX2 territory ($379). Sony is known for making great hardware, but they tend to drop the ball on customer experience (why are they still forcing us into Memory Sticks instead of letting us use the SD and MicroSD cards we have lying around?). Here, Sony doesn’t offer a way to buy and download e-books wirelessly, whereas the Kindle lets you buy any book you can think of in 30 seconds, without a computer. Even when using your computer, you’ll find the Sony E-Reader store almost an afterthought, with lower selection, worse prices, and an inferior browsing experience to the Kindle store. I’d only recommend the Sonys to someone a bit computer-savvy and who enjoys the hassle of finding e-books from other sources (like Project Gutenberg and libraries). And, as with most Sony products, the bottom line is that they’re too expensive compared to the competition. I just can’t see paying close to double the price (compared to the $139 K3 Wi-Fi) for the $229 Touch Edition, and not even getting Wi-Fi connectivity.